‘Bear’ for monitor, guitar and microphone issues. The ‘rock room’ is jamming the limited edition vinyl Record Store Day 2013 edition of the performance, but it can be had in compact disc format for a limited time from the Grateful Dead website. This show is intimate, low key and thankfully preserved on the aforementioned hissy undiscovered reel of tape. Garcia’s wife Mountain Girl returned the discovered stash of tapes to the GD vault in May 2013 after her suprising discovery. The caveat on the back of the LP mentions that the ‘rare recording was made on a non-professional machine at low level and contains some tape hiss and other undesirable stuff’. 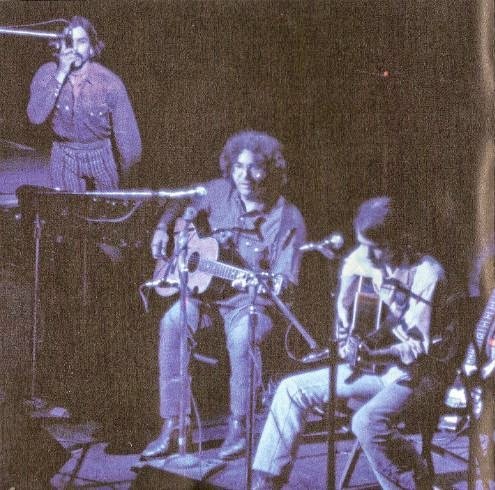 Regardless of the sonic anomalies, the tape reveals the early acoustic Dead taking their time and their founding member Pig Pen in his natural element. One has to think that Garcia felt the performance was worth preserving and/or holding onto due to its renditions of newly composed tunes and possibly to review as a precursor to the numerous May 1970 acoustic performances. Regardless, this tape is an ace document of the groups expanding acoustic sensibilities and maturing songwriting abilities for the era. The performance begins smelling of pot and chilled on ice as the band, with light percussion and straight acoustics vamp on a brisk ‘I Know You Rider’. Garcia sings the ‘drink muddy water’ line soulfully, a favorite of early renditions. 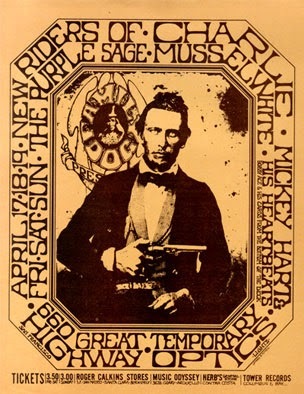 At some points it feels as if the band is going to drift away, their only grounding the delicate brushes of the drummers and the harmonies supported by guests Dawson and/or Nelson from the New Riders of the Purple Sage. The following ‘Don’t Ease Me In’ gets the tempo thumping as Garcia and Weir joyously join together in hippy hillbilly harmony. The band gently berates ‘Bear’ following the song for the monitors not working properly (yet again). 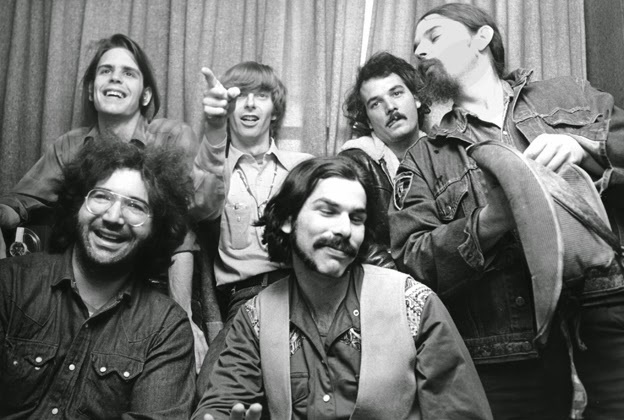 This exchange in classic Grateful Dead fashion is humorous, trippy and slightly disorienting. ‘Silver Threads and Golden Needles’ follows first recorded by Wanda Jackson in the mid 1950’s and spotlights beautiful honky- tonk Garcia picking and joyous Lesh high harmonies. The song becomes an intimate campfire performance with the scent of woodsmoke and fire fried food intermingled with the classic country melody. Weir becomes slightly annoyed with ‘Bear’ following this track sternly imploring ‘Bear’ to fix the monitors followed by sarcastic asides from Garcia and Lesh. ‘Friend of the Devil’ appears in its original beat the morning sun to the horizon guise and seven months before its appearance on American Beauty. Garcia sings in his fragile youthful throat, confident of the tune, chest puffed out at the satisfaction of composing such a stellar track. The songwriting team of Hunter/Garcia was reaching their songwriting peak during this time as is wonderfully illustrated throughout this show. Bonus points to Weir for his outstanding woody filigree additions to the song. A great moment follows with Lesh and Weir slyly commenting to certain audience members who are calling for ‘Dark Star’ and even ‘White Rabbit’ during the performance. I’ll let you listen for yourself for this segment of golden dialog. ‘Deep Elem Blues’ is another highlight of the recording with the band pulling out a slinky back alley version highlighting Garcia and Weir’s acoustics braiding together copacetically. The groove wobbles like an antique top while Garcia and Weir harmonize on the chorus nicely. Weir asks the audience if anyone has a tomato, presumably to throw at ‘Bear’ due to the still persisting monitor issues. ‘Wake Up Little Suzie’ is given a typically excitable 1970 reading with the drums jumping to the front of the line for the first time. This performance quickly segues into ‘Candyman’ which would not appear until November on American Beauty. Consistent to the evening’s performance thus far Garcia is vocally invested in the song and the track moves like a john boat catching a current, prior to its becoming a dirge in intervening years. ‘Cumberland Blues’ is the first recipient of Garcia’s electric guitar making an appearance and is announced by Garia as ‘something new’. Its debut performance had come in November of 1969 and its official release would be on June 1970’s Workingman’s Dead. This early ‘Cumberland’ churns and burns with Garcia’s ‘chicken picking’ an obvious highlight. The second solo reverberant in its elasticity as Garcia tickles the ears with twangy and pointed riffing.Weir and Lesh stand just outside the tunnel percolating with locomotive tempos. ‘New Speedway Boogie’ takes things to a different level, with Garcia coaxing silver rail tones from his ax and Weir aggressively scratching the electric washboard. Two nice jams develop bookended by decent vocals from Lesh and Garcia. 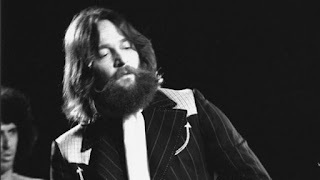 It was during this time that the band was hanging out and singing with Crosby, Stills and Nash and this show illustrates that the practice has helped considerably. This song would also appear on Workingman’s Dead two months from this reading but was already reaching maturity by this point in time having been composed after the December 1969 Altamont fiasco. Garcia now looks for ‘Pig Pen’ to come out and do some tunes and is told he’s ‘in the office’. So to kill the time the boys pour themselves into a languid ‘Me and My Uncle’ that highlights sweet harmony vocals by Garcia, unique to this early version. ‘Mama Tried’ follows in a fresh homegrown rendition; it sounds like John Dawson and David Nelson from the ‘New Riders of the Purple Sage’ make their presence felt on this tune adding vocals and some twinkling acoustic guitar. A relatively unique arrangement and fresh approach for a song many would feel quickly grew tired from its constant performances. This particular version is a joy to behold. 'Pigpen’ is finally found, recruited and takes the stage to Garcia’s announcement. ‘Pig’ then takes a seat and performs a substantial twenty minute slice of acoustic blues. 'Pig’s’ signature Lightning Hopkins cover of ‘Katie Mae’ starts things off but is unfortunately cut and faded out. Fortunately its followed by a version of ‘The Rub’ driven by ‘Pig Pen’s’ tapping boot heel and smoky vocal's. A moaning and amazing ‘Roberta’ follows and finds ‘Pig’ in peak form. Perfectly understated blues accompaniment on acoustic guitar is dressed in McKernan’s boozy growl and bluesman time keeping. This and the following Hopkins number ‘Bring Me My Shotgun’ find ‘Pig’ in the ditch, singing a gutbucket blues. You get the feeling that there is nothing else that he would rather be doing at the moment. It may as well be the living room for ‘Pig’, this tape as such a wonderful find and lucky capture of one of the Grateful Dead’s founding members. This solo spotlight is reason enough to justify the release of this recording. 'Pig' displays under appreciated guitar skills and a nuanced understanding of the 'country blues'. The recording concludes with a dark bottom of the bottle reading of the traditional blues ‘The Mighty Flood’ which segues into the Lightning Hopkins blues ‘Black Snake’. The heartbeat of the moan is ‘Pig’s heel on the worn stage and the scratch and pluck of his wooden frog box. Deadly serious 'Pig' tells the tale, forceably grabbing my attention through his dynamic display. Toward the end,‘Pig’ lets out a grunt and slips out the rear porch like a back door man leaving the cheering crowd with a quick ‘Thank You’. The MC takes the microphone and thanks ‘Pig Pen’ as well as ‘Mickey Hart and the Heartbeats’ before the tape concludes. This aged recording is a wonderful find and welcome addition to the substantial Grateful Dead live music collection. 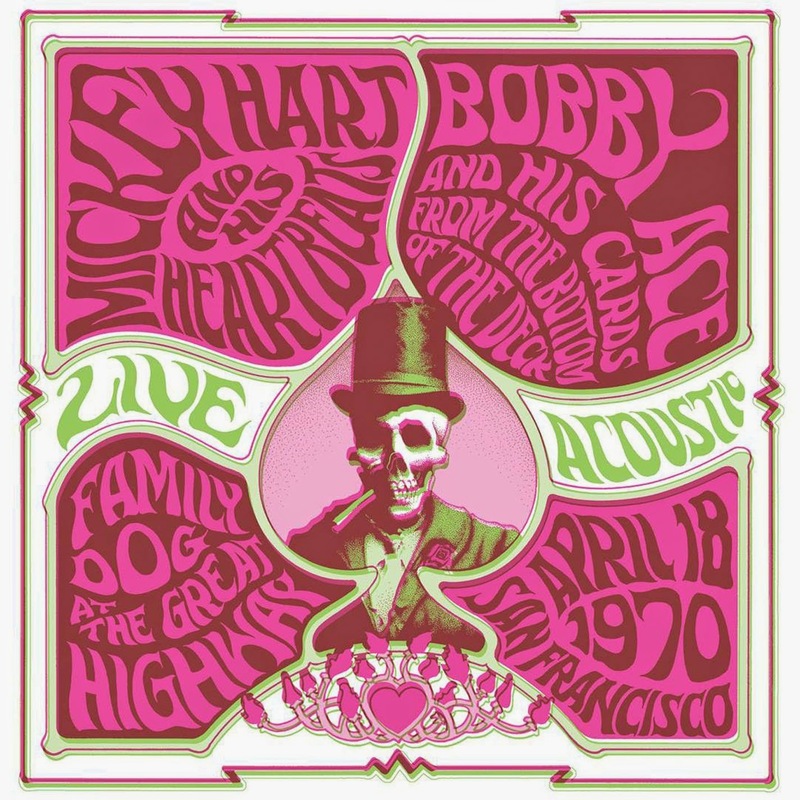 This limited edition (7500) vinyl recording is unique due to the special ‘Pig Pen’ solo spot as well as the stony acoustic Dead slot that would only get better moving from April into May 1970. Other live releases such as the famed Harpur College and Fillmore East performances from May 1970 may offer better sonic quality and even better renditions, but there is something contained here that makes this recording a special anomaly. ‘Pigpen’s’ revealing solo spot as well as the intimate and easy ‘Grateful Dead’ performance make this a must have for any Grateful Dead fan.